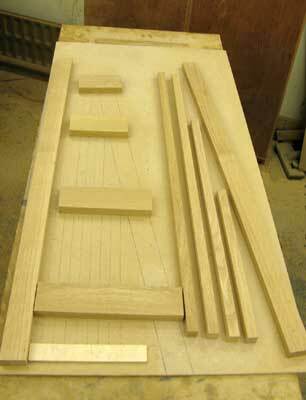 The completed half lap joints - do not forget to save your jig for next time! ASSEMBLY: Be careful when clamping: make sure youuâ?re not putting undue pressure on areas that do not need it, and that the joints are firmly secured. It is best to find a friend to help! I had recently finished refurbishing a bedroom in our Yorkshire farmhouse, and it was decided that it would be nice to have a pair of small open bookcases to keep a selection of bedtime reading tidy and convenient. They were to blend in with the existing furniture and fittings, which were all of European Oak in an Arts & Crafts style. 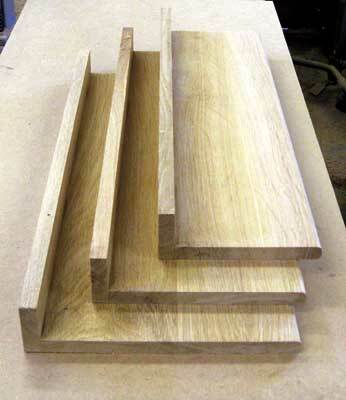 1 From the cutting list, nominal 1" rough sawn European Oak was roughed out for the project. As my stock was only about 160mm wide, glue-ups had to be prepared for the shelves and top, prior to final planing to 22mm. 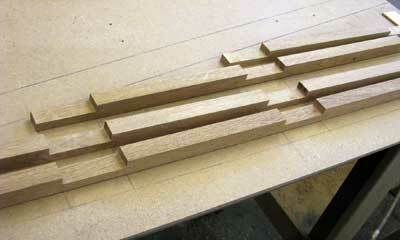 The stock for the vertical slats was then planed to 22mm square. 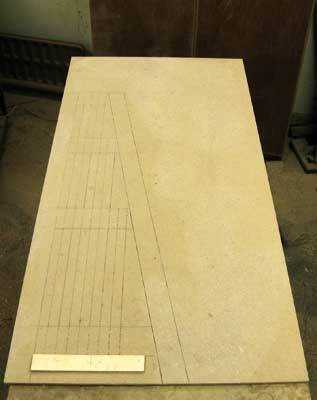 2 By reference to the pattern, the vertical slats were then cut accurately to length. Each of the cross rails was squared at one end, and left about 50mm over length for later trimming at an angle. For the same reason, the front and rear vertical members were left over length. 3 To rout the half lap joints in the vertical slats, a very simple router jig was made, using two pieces of excess 22mm stock from the project and two strips of 6mm MDF. The MDF acts as a fence for the router. 4 I used an 18mm straight cutting bit in the router, and, having screwed one of the MDF strips into position, the other strip was clamped and adjusted until the router ploughed a groove in the front member of the jig exactly 70mm wide, so that a cross rail would just slot in the groove. 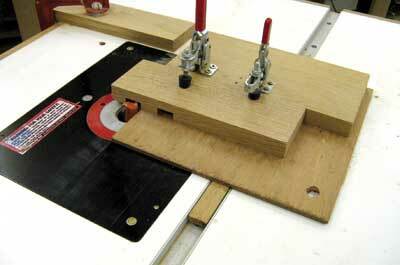 Having achieved this, the second MDF strip was screwed down. 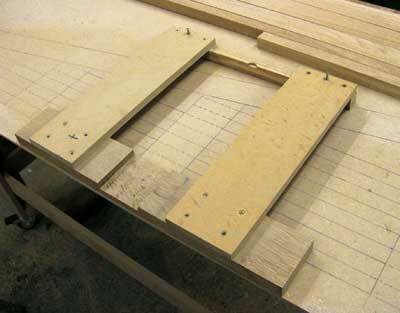 A plywood end stop was tacked onto the pattern for registration purposes, and I bundled together all the vertical slats for both end panels, so that they would all be routed at the same time. 5 With all the slats in place, the jig was clamped to the template exactly in line with one of the cross rails, and the rear of the jig screwed firmly to the pattern. Two passes were required to excavate the slats accurately down to 11mm. 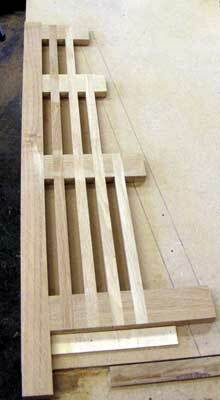 Without moving the slats, this procedure was repeated to produce the four joints for each end panel. 6 With the 22mm bit mounted in my home-made router table, a tenoning carriage sliding in the mitre track in the table top was used to cut the half-lap slots in the cross rails. A test piece was used, and the router bit cut through the oak to the required depth of 11mm in one pass with ease, so, once set up, the job proceeded quite rapidly. Marks were transferred from the pattern onto the bottom (longest) cross rail. These marks were used to set up the router table for each cut, and a stop clamped in place to make repetitive cuts on the other cross rails without the need for measurement. 7 The joint-making procedure worked very well first time, and, on dry fitting, the slats and cross rails clicked satisfyingly into place. Having glued up the sub-assembly, the rear vertical member was then laid in position on the pattern, and marked out for No. 20 biscuit slots to attach it to the cross rails. 8 Having clamped and glued the rear stile, the sub-assembly was then placed again on the pattern, to mark out the cuts for the 10 degree slope on the front edge. My saw has a sliding table, and it was a simple matter to hold the assembly firmly in position on the slider, and run it through the saw, but using a circular saw with a guide fence would be just as good. 9 Back to the template, and the front stile was marked out for biscuits, and attached as before. 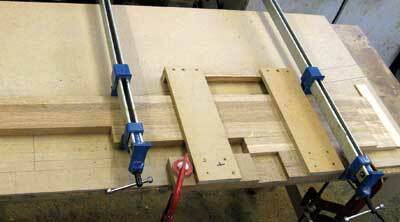 The offcuts from the angle cut came in very handy here for the clamping operation. 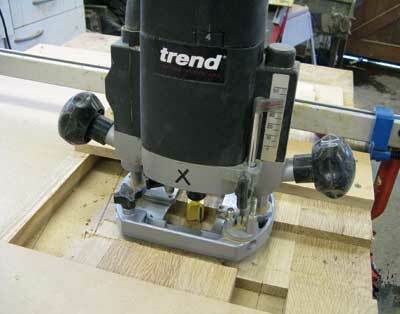 Once assembly was complete, the end panels were trimmed to the finished size on the table saw. 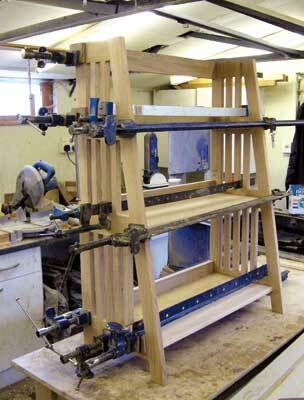 10 Having made the end panels, these were set aside, and attention turned to the shelf sub-assemblies. 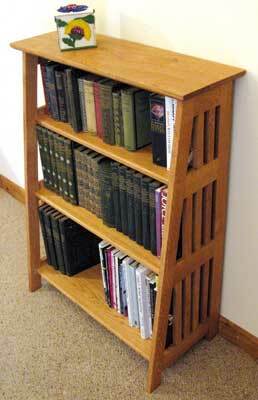 In order to give the bookcase good rigidity, each of the three shelves was made with a 70mm upstand attached at the rear with No. 20 biscuits. In addition to providing stiffness, the upstand acts as a backstop for the books. 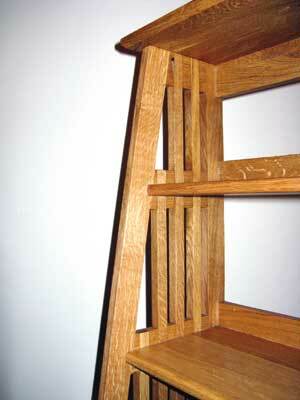 A half-round was routed on the front edge of each shelf. 11 The shelves were attached to the inside surfaces of the end panels along each of the cross rails with biscuits. Careful marking out is essential, and a straight edge was clamped to the side panels to act as a fence for the biscuit cutter. Having cut the biscuit slots, and done a dry fit, the shelves and the inner surfaces of the end panels were thoroughly sanded, prior to final assembly. 12 Strategically placed pocket screws in the side panels and back rail were to be used to attach the top, and a pocket hole jig was used to cut the holes prior to assembly. 13 With so many joints to glue up at once, thanks go to my wife Catherine, for providing an extra pair of hands to help locate the joints and wield the clamps. With everything sitting nice and square on a flat surface, the clamps were left on overnight for the PVA to cure. 14 The top was cut with a 25mm overhang all round, and the underside routed with a 45 degree chamfer, to lighten the appearance. After sanding the outside surfaces of the end panels, and the underside of the top, it was attached using panhead screws in the pocket holes cut earlier. 15 Construction was now complete, and a few hours were spent hand sanding all accessible surfaces down to 180 grit, and dust removed with a vacuum clean and tack cloth. 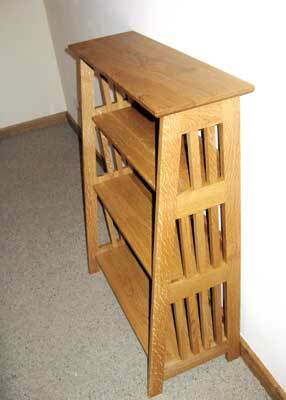 16 My favourite method of finishing oak is to use Liberon Finishing Oil. The first application is diluted 50% with white spirit. I find that the white spirit gives excellent penetration, and carries the oil deep into the timber. It is applied liberally with a brush, left for 10 minutes, and all the excess wiped off with a cotton rag. The furniture is then left overnight for the oil to harden, and it is then thoroughly sanded to 240 grit. Any blemishes or stray glue deposits may need to be removed with a scrap of 180 grit paper. 17 After vacuuming and wiping down again, it is ready for the second application, which is oil diluted with 33% white spirit, and the whole brushing, wiping and sanding procedure repeated, this time with 320 grit paper, or foam-backed fine grade sanding sheets. Neat oil is used for the third coat. 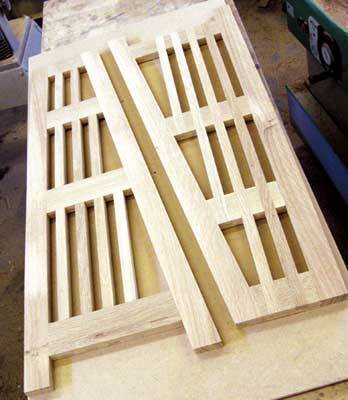 18 Subsequent coats are just wiped on with a clean cloth, until the desired finish is obtained. After leaving for a couple of days to harden, the furniture is then waxed and buffed with beeswax polish. To suit your own house, you might well want to use a different finish, but whatever the case you'll have a charming bookshelf in no time at all! "My favourite method of finishing oak is to use Liberon Finishing Oil"